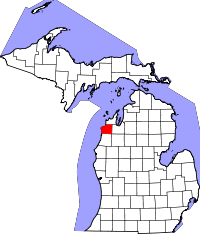 Not only is Benzie County the smallest county in Michigan, but over 60% of the area designated to it is water. The county borders Lake Michigan and boasts approximately 16,000 residents. Vital records for the county are available for research at the genealogy research department in the County Clerk's office during regular business hours. Birth records are available from March, 1868 to the present, death records from April, 1868 to the present, and marriage records from May, 1869 to the present. The County Clerk is located in Beulah, MI., at 448 Court Place. Copies of records are available for $7 each, and $3 for subsequent copies. A number of state forests and parks run through Benzie County, including the Pere Marquette State Forest, a forest which runs through 13 counties total and offers many miles of trails for biking, hiking, and skiing.